Thank you for wanting to help us continue in our work here in Lille. If you would like to make a regular or even occasional donation to the church and you are a French tax payer, you can obtain tax relief on your giving. Please contact the Treasurer treasurer@christchurchlille.fr . It’s easy, it helps us, and you get tax relief, so everyone benefits! Many thanks! For information about how our church is funded and maintained, please click this link: Graceful Giving And you can find a Pledge form here. If you are a UK taxpayer, you can donate with Gift Aid. Please contact the treasurer for more information. 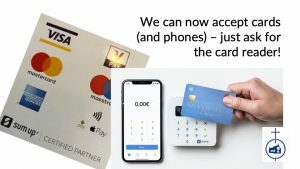 And if you are in church, you can use the card reader, with contactless, chip and pin or apple/google pay! You can make a donation via Paypal or Credit Card, just click on this “Donate” (“Faire un don”) button.